Entering The New Quarterly office for the first time was nerve-wracking. I had no idea what to expect. All I knew was that my previous English teacher had worked with the publication, and that I would now be working there for the next five months. What I found was a welcome surprise; possibly the best co-op placement I could have asked for. A small office packed with four desks and a very quickly approaching festival on hand that had me jumping into my work within the week. I had no real experience in drafting formal emails and helping organize applications, but I learned. Throughout my time with TNQ, I picked up new skills and found myself diving deeper and deeper into the world of Canadian Literature. It felt intimidating at times, surrounded by such talent and well thought-out work (most of my own writing comes to a standstill after a while). However, it also allowed me to better understand the true value of a written work and try to value my own works as much as the other fabulous pieces I got to read every day. 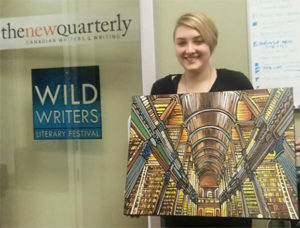 I was also blessed with the chance to attend (and help host) the Wild Writers Literary Festival in November, where I met so many talented authors, young writers attending as a part of the bursary program, and long-time TNQ supporters. It was a wonderful experience that I hope to replicate in the years to come. I joined The New Quarterly’s office as a part of the UCEP program with the University of Waterloo—a program which allows high school students to experience a semester at university and discover whether they want to continue on a particular academic path. The program helped me decide on my current route into postsecondary education, and my time at TNQ has firmly cemented my love for writing and literature as the front-runner in my top career choices. As my family could tell you, this happy success is largely in part to the supportive and hardworking staff at The New Quarterly and all the groundwork they laid to help me build my own success. As I left the office for the last time, it felt surreal—like I would be returning the next day regardless. But it didn’t happen; instead, I sat at home and pondered what to do now with my sudden free time. The obvious answer was to write (and study for upcoming exams), which is what I continue to do. Since beginning my time in my co-op, I have found it much easier to write pieces of short fiction and even dabble in some poetry writing. I know that I will continue to be a future TNQ supporter and will hopefully inspire more young writers to enter the UCEP program, or to even simply explore their possibilities by looking into publications like TNQ. And so, I bid a fond farewell to this wonderful chapter and will continue forward with my pen in hand to write the next. Although, this will hopefully not be the last you hear from me, because once you come on board with TNQ, you never truly leave.